RENEWED HOPE: The world's first face transplant recipient, Isabelle Dinoire, pictured for the first time in public since her operation. SHE is house-hunting, planning a new career and her once-broken heart is filled with hope. Isabelle Dinoire knows that rebuilding her life will be a slow process. But, even though her scars are still livid, she can now look at the world with optimism. 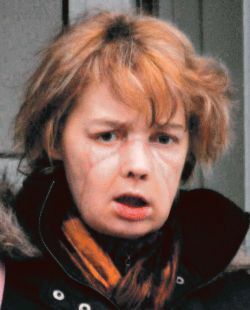 Barely two months ago, the 38-year-old French divorcee received the world's first face transplant and this exclusive photograph reveals the full extent of her remarkable transformation. Last May, she had a wide, tilted nose, a prominent chin and thin lips. Today, the donated face of suicide Maryline Saint-Aubert has given her a straight and narrow nose, a neater chin and a fuller mouth. Despite the prominent surgical scars, Miss Dinoire and her doctors say they are delighted by the results. The operation has left her new mouth looking somewhat loose, but surgeons are confident she will regain control over her partially paralysed face. Her recovery, they point out, is still in its early stages. Only last month, she appeared to be rejecting the precious new tissue, but a course of steroids has put her recuperation on track. The transplant was performed by a team of 50 surgeons in Lyon, led by Jean-Michel Dubernard. Five months earlier, Miss Dinoire's features were destroyed when her labrador savaged her while she was unconscious after a drug overdose. Her face was left a patchwork of torn flesh and exposed bone – so shocking that one of her two teenage daughters refused to look at her. Miss Dinoire could not venture out of her home on the outskirts of Valenciennes, northern France, without wearing a dental mask. And the stares of strangers and their insensitive comments left her depressed. But things are improving. She admits that the weeks spent in hospital in Amiens, hundreds of kilometres from her family, have been gruelling. She said: "I spent Christmas in hospital, which was pretty awful really. The doctors cannot yet give me a date to go home. "Lots has been said about how happy I am, but this has not always been the case. I spend almost all my time in my hospital room. "Here, I have radio and television and there is also an exercise bike in the corner. I haven't started using it yet, but that may change." This week, she left hospital to go home for the first time – a huge psychological step towards normality – to see her daughters Lucie, 17, and Laure, 15. Miss Dinoire remains reluctant to visit shopping centres and other busy places. But under the close supervision of a team of psychiatrists, she is gaining the confidence to return to society. In preparation for that important moment, she met housing officials in Valenciennes on Thursday. It is thought she is considering moving to a neighbouring town with her daughters. She says she is in a positive mood – though she is chain-smoking again – and is making plans to study computers and accounting at college, with a view to opening a baby-clothes shop. She now has some feeling in her new face, a huge improvement from the early days after the operation when she felt nothing as she splashed water on her face or pressed her skin. Her voice then was muffled by the paralysis and she found it hard to chew. Now, she can eat and is relishing food and drink. They are small pleasures, but to her they are miracles. "I am eating as much as I can," she said in an interview with People magazine. "I love fresh strawberries, but have also eaten omelets, chocolate cake and all kinds of other food, including the odd glass of red wine." Her new diet is helping her regain some of the weight she lost after the attack. But she still looks gaunt, with her fashionable jeans hanging off her slight frame. Another of her surgeons, Bernard Devauchelle, said: "Her facial expressiveness is slowly returning and she is talking quite clearly, but has some problems with the letters P and B, which require the lips. "She certainly does not look like the living dead. She's eating and drinking without dribbling. "Psychologically, she has totally accepted her new face. Her return to smoking is not the best thing. But that's what she wants to do – we can't stop her." Dr Devauchelle and his colleagues faced ethical questions about the transplant. The fact that Miss Dinoire had attempted to commit suicide led critics to ask if she was psychologically robust enough to adapt to life with someone else's face. As a single parent, she had struggled to cope with her daughters and, according to friends, spent most of her time chain-smoking in front of a TV. Then it emerged that the 46-year-old donor had committed suicide. There is still a risk that Miss Dinoire's body will reject the new face and for the rest of her life she will have to take preventative drugs, which cause an increased risk of cancer and kidney disease. But she is not letting anything spoil her hopes.